8am-outside air temperature – 79 degrees, warming to 91 degrees by 10am. 84-degree water temperature with an 10 knot east breeze, 2-3- foot seas, a mild north current and visibility of 30-plus feet on the reef. Crew-Chuck Van Buskirk, Andy Rubin, Charley Schram, Rosalie Opalka and myself. Today was different as the Chiefy crew targeted lionfish for harvesting. We occasionally see lionfish on the reef, however, we are normally busy grabbing spiny lobster and keeping our eye out for bigger fish such as grouper and snapper. Plus, you must be properly equipped to deal with lionfish, as the pain from their spines will make a grown man cry. Our purpose was two-fold today; we needed to harvest some lionfish as Charley and Rosalie were doing a presentation to the spearfishing club on Tuesday, in addition, we wanted to scout some areas for lionfish as we were competing in the 1st Annual Pompano Lionfish Derby in two weeks. Getting lobster and lionfish are primarily done in the same area, as they tend to be found in the same location on the reef. As I’ve said before, lionfish are a great clue there are lobster in the area, but if you see lobster, be aware of lionfish. We use a mesh bag to carry our lobster and we need a puncture-proof plastic tube for collecting lionfish. Also, we use a snare to catch our lobster and use a small tri-prong pole spear to harvest lionfish. We accomplished our mission of getting some lionfish for Charley and Rosalie’s presentation and scouted the area. 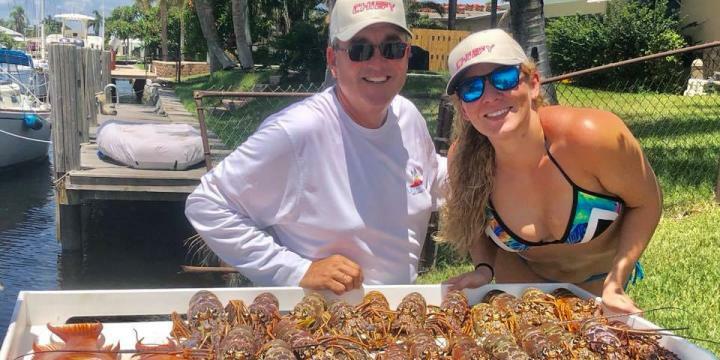 The good news is we caught four lionfish, two nice hogfish and some lobster making it was a very productive day diving off the Greater Fort Lauderdale area.